"In time of peace, prepare for war"
About half past 3 o’clock this morning the large hotel in the 4th Ward of this city belonging to Gottlieb Baumann was discovered to be on fire [Western Star Hotel, corner of W. Cady and N. Water]—in fact so nearly wrapped in flames that those sleeping in it barely had time to escape. It was a large three story wooden structure, and being very dry, the fire spread so rapidly as to render all attempts to extinguish it entirely useless. A few beds were all it was possible to get out. Everything else such as furniture, fixtures and provisions were consumed. We understand there was no insurance on the property and if this is the case, of course, the loss, which cannot be less than $2,000, will be total. The firemen were promptly on hand and did all that could be accomplished under the circumstances. They had everything in good working order but the building was too far gone to be saved. The Watertown Rifle Company, who kept their arms in this building, have lost all their accoutrements. Next Monday evening there was to have been a concert and ball in the fine hall of this hotel. By a notice in another column, it will be seen that the concert will take place at Cole’s Hall and the proceeds be given to Mr. Baumann, who has had the misfortune to meet with a calamity so sudden and severe. In view of this generous object, we hope the attendance will be general and the proceeds large. Gottlieb Baumann, father of Alfred Baumann and Mrs. Otto R. Krueger came to Watertown in 1846 with his father and brothers, Jacob and John. Baumann had been captain of the old Watertown Rifle Company for some years. 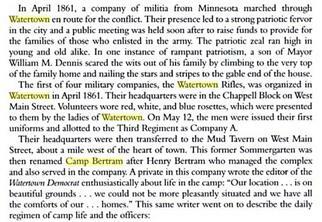 The Watertown Rifles, a military company, lost their distinctive uniforms, stored in the Western Star Hotel, along with rifles and ammo as the Western Star burned to the ground. The Watertown Rifles had been organized in 1853 and the company drilled regularly and took part in patriotic displays on July Fourth and Washington’s Birthday. The group disbanded in 1861 at the outbreak of the Civil War. In 1861 Baumann went to New Orleans and was pressed into the confederate army and when our 20th Wisconsin Regiment came to New Orleans he enlisted in the Watertown Company E and became a first lieutenant. C. Hugo Jacobi, Reminiscences of Early Days in Watertown, a series of newspaper articles, 1923. This is the name of a company of volunteers that has been organizing in this city during the past week. Its members are mostly young men who, with proper discipline and training, will make brave and reliable soldiers. It is their purpose to offer themselves for active duty, but whether their services will be immediately accepted and required is now uncertain as the regiment called for from Wisconsin is now full, and nineteen other companies, like this, in different parts of the state, are ready at a moment’s notice to answer the demand of the Governor. If no further requisitions are made by the President, perhaps they will not be needed. Its officers have received commissions, the men have been sworn in, and all that is now wanted is an opportunity. The headquarters of the company are in Gen. Chappell’s Block, before which the Stars and Stripes are now floating. When a room was wanting in which to meet, he cheerfully furnished one without expense to any body. The subscriber has opened a shop for manufacturing all kinds of work in his line. Wanted: 20,000 round hickory hoops; 100,000 flat ash hoops; 50,000 pork barrel staves, for which the highest case price will be paid. Having worked for the old settlers of Watertown and vicinity sixteen years since, and being well known to the inhabitants, I feel the utmost confidence in once more soliciting their patronage. I intend making Watertown my permanent place of residence and hope to merit and receive a liberal share of business. Shop 4 doors below Watertown House, 1st St.
Presuming your business engagements have prevented your compliance with the numerous invitations given you to visit us since our removal to our present quarters, it may not be uninteresting to you and your many readers to hear from the Watertown Rifle Company at home. How the neatly painted edifice, surrounded by handsome floral and fruit gardens, together with the numerous bowers of honey suckle and grape vines, now clothed in the richest verdure of spring, could ever been so named, is a mystery to the stranger. Suffice to say, we could not be more pleasantly situated, and thanks to our worthy host, we have all the comforts of our domestic homes, and were it not that duty calls, we would regret being compelled to quit this resort, until we are summoned to immediate service, which, as soldiers, we are enlisted for. Our daily camp duties are much the same as those of other camps at Milwaukee and Madison; viz. reveille at 5 o’clock a.m.; Breakfast at 7, the interval occupied in neatly folding our mattresses and blankets, blacking boots, brushing clothes, cleaning accoutrements, washing and otherwise preparing for the requirements of the day; 8 ½ o’clock “Guard mounting,” the guard consisting of one Sergeant, one Corporal and six Privates, whose duties continue for twenty four hours; at 9 o’clock “drill call” when every man must appear fully uniformed and equipped for two hour’s drill; 12 o’clock dinner; now comes the “tug of war” and if the attack and onslaught of the viands may be a criterion of their attack of the Southern blood hounds, then Wisconsin will need no more soldiers; two o’clock again drill until four, after which time is spend in recreation of different kinds. “Retreat” is beat at six. Supper and amusements till 9; fifteen minutes after every one is supposed to be in bed and lights extinguished. Our officers are men of whom we may rightly be proud—as men, kind and humane—as officers, efficient and energetic. Capt. D. S. Gibbs is a veteran who has served in the ranks, and not only knows the wants of a soldier but has acquired the ability to command, and too much credit cannot be given him for his energy and perseverance in forming this Company, attending to its wants and placing it in the first position in the 3d Regiment, although working against influences which, to my knowledge, no other commander has had to cope with—and he has nobly gained his object. Lieut. Henry Bertram, who at present acts in the double capacity of officer and landlord, is also an old and tried soldier, thoroughly schooled in the tactics of the army. Second Lieut. John Forsyth is too well known as an upright and honorable business man to need comment from me. Serg’t Goodrich possess the qualifications of a scholar, but like ourselves, has yet to achieve military fame. Our destination is not yet known, but rumor says we are to rendezvous at Fond du Lac; there should be any news pertaining to the company you will hear again from. 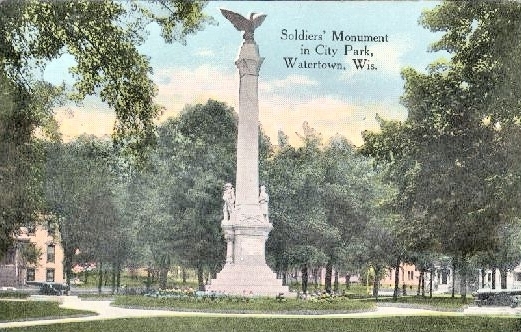 The Watertown Rifle Company, which stands at the head of the Third Wisconsin Regiment, left this city last Saturday for Fond du Lac, the head quarters of the Regiment under the command of Col. Charles S. Hamilton. Their destination is the city of Washington, whither they have been ordered for active service. A large number of citizens were present to bid the defenders of the Union farewell and wish them all a safe return from the dangers and perils of the battle field, where they will do their whole duty bravely, no matter what fate awaits them. Mayor Williams made a brief and appropriate speech on the occasion; the train started, and they were off.